In the aftermath of the deadly shooting at a high school in Parkland, Florida, a majority of American teens say they are very or somewhat worried about the possibility of a shooting happening at their school – and most parents of teens share that concern, according to new Pew Research Center surveys of teens ages 13 to 17 and parents with children in the same age range. Meanwhile, when it comes to what can be done to prevent this kind of violence, far more teens view proposals focused on mental illness, assault-style weapon bans and the use of metal detectors in schools as potentially effective than say the same about allowing teachers and school officials to carry guns in schools. The surveys of teens and parents were conducted in March and April 2018, following the Feb. 14 shooting at Marjory Stoneman Douglas High School – one of the deadliest mass school shootings in U.S. history. Seventeen people were killed in the attack and more than a dozen others were injured. The surveys also come as the nation prepares to mark the 19th anniversary of the shooting at Columbine High School in Colorado. Overall, 57% of teens say they are worried about the possibility of a shooting happening at their school, with one-in-four saying they are very worried. About three-in-ten (29%) say they are not too worried about this, and just 13% say they are not at all worried. 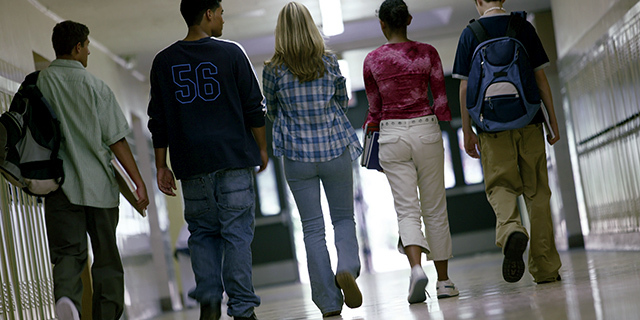 Nonwhite teens express a higher level of concern than their white peers. Roughly two-thirds (64%) of nonwhite teens, including 73% of Hispanics, say they are at least somewhat worried about this, compared with 51% of white teens. School shooting fears differ by gender as well: 64% of girls say they are very or somewhat worried about a shooting happening at their school, compared with 51% of boys. Parents of teenagers express similar levels of concern as teens themselves, with 63% saying they are at least somewhat worried about the possibility of a shooting happening at their child’s school. And there are similar patterns when it comes to race and gender, with nonwhite parents and mothers expressing more concern. Lower-income parents are particularly worried – in fact, 82% of parents with annual household incomes under $30,000 say they are at least somewhat worried that a shooting could happen at their teen’s school, compared with 64% of those with incomes between $30,000 and $74,999 and 53% of those with incomes of $75,000 or more. Against the backdrop of organized school walkouts and marches calling for new legislation to address gun violence, teens see more value in some proposed measures than others. 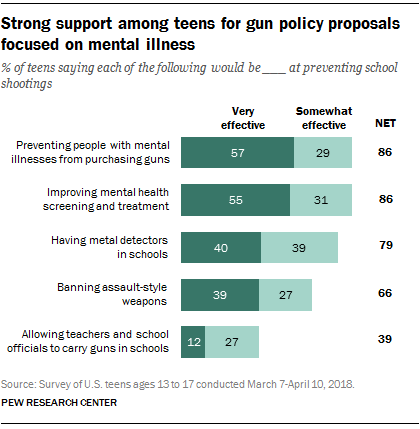 Asked to assess how effective various measures would be at preventing school shootings, 86% of teens say that preventing people with mental illnesses from purchasing guns and that improving mental health screening and treatment would be effective, including majorities who say each of these proposals would be very effective. Roughly eight-in-ten teens (79%) say that having metal detectors in schools would be effective and 66% say the same about banning assault-style weapons. By contrast, a much smaller share of teens (39%) say that allowing teachers to carry guns in schools would be very or somewhat effective at preventing school shootings; 35% of teens say this would be not at all effective. 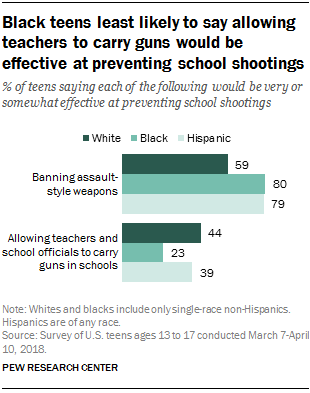 Black teens are far less likely than white and Hispanic teens to say allowing teachers to carry guns in schools would be at least somewhat effective: 23% of black teens say this, compared with 44% of white teens and 39% of Hispanic teens. Views on the effectiveness of banning assault-style weapons also differ by race and ethnicity. About eight-in-ten black teens (80%) and Hispanic teens (79%) say this would be at least somewhat effective; a smaller share of white teens say the same (59%). And while teens across racial and ethnic groups are about equally likely to see metal detectors as effective, black teens are far more likely than their white and Hispanic counterparts to say this would be very effective (59% vs. 39% and 41%, respectively). Teens’ views on proposals to prevent school shootings mirror those of the general public, for the most part. About eight-in-ten Republicans and Republican-leaning independents (78%) say that allowing teachers to carry guns in schools would be very or somewhat effective at preventing school shootings, compared with just 24% of Democrats and Democratic-leaning independents. Democrats, on the other hand, are far more likely than Republicans to say that banning assault-style weapons would be at least somewhat effective (81% vs. 35%). 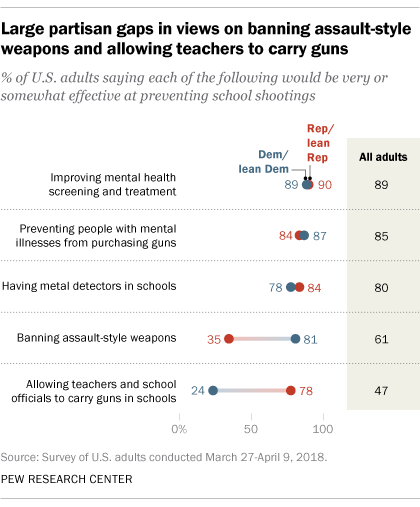 But there are some points of partisan agreement – substantial majorities of both Democrats and Republicans say that proposals directed at mental illness and having metal detectors in schools have the potential to be at least somewhat effective in preventing school shootings. Correction: In a previous version of this post, the charts and topline gave an incorrect end date for the period during which parents and teens were surveyed. The survey ended April 10. Note: See full topline results, teens and parents methodology and general public methodology here (PDF).